All of the various glass drills are meant to be used WET. We suggest using a cordless tool, otherwise take extra care to avoid electrical shock while drilling in a wet situation. Always let the drill do the work Apply gentle pressure and keep the bit as perpendicular to the glass surface as possible. Using a drill press attachment for a cordless drill is a handy set up if you will be doing a number of holes. 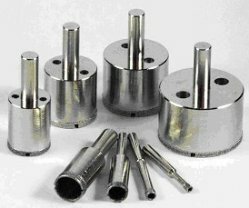 Micromite drills are often used in jewelry work as they produce the smallest holes. 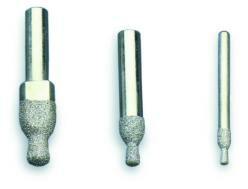 Glastar Drills will fit any hand drill, cordless preferred. Quick and easy to use. Again, keep the bit wet and apply gentle pressure and you can get dozens of holes from each bit. Sold individually. Use in any cordless drill with 3/8" or larger chuck. Use of a drill press is NOT required, but in some cases, when drilling thick material or larger holes, you may find a drill press easier to use. Remember to keep drills constantly wet for best results and longer drill life. Use this bit in any drill press or hand drill. If drilling using a hand held drill, be sure to keep the bit straight up and down. Regardless of which drill you use, be sure to keep the bit wet at all times to avoid thermal shocking the glass and for greater bit life.